Abstract: The structures of contemporary art engagements limit the forms of representation of art and its interactions. But is it really so or does the new wave of spoof art events challenge an overbearing system of unwritten rules that is eroding basic democratic principles? Is spoof art the mirror revealing the existence of spoof democracy? The paper analyzes these issues through an art practice that focuses on the fine art knowledge as a system of truths, which although not based on scientific argumentations, are not less valid in their attempt to capture the contemporary reality of social events. From the non-event titled I Am Sorry the Exhibition Has Been Censored by the Artist the paper analyzes the exhibition’s attempt to relate contemporary technocultures, social events, aesthetic approaches and far-fetched theory to evidence an increasing trend in the lack of artists’ autonomy. This lack of autonomy, as both Theodor Adorno and Jean Baudrillard write, eliminates the elements of fait-social and meaning in contemporary artworks. 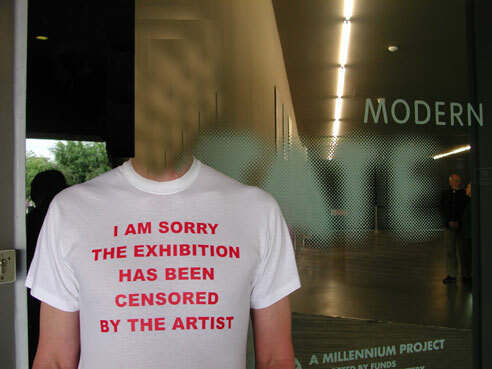 The Internet has become a place of censorship and surveillance of behaviors, but even more worryingly galleries and traditionally irreverent art exhibition spaces have been further restricting the content of what is allowed to be exhibited. 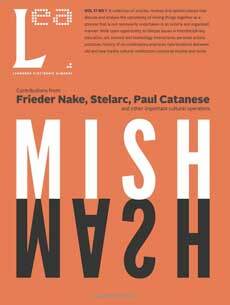 Anything that raises issues of political engagements and goes beyond institutional debates disappears in a series of legal entanglements in order to institutionalize the output within the context of an academic and curatorial self-referential discourse. Artists strive to fit within the pre-approved aesthetic parameters that have been homogenized in all of their constituting elements. The artists in this scenario, as Jean Baudrillard would say, serve the final anaesthetized representation of political and social discourses sprayed with nebulous and long-winded foggy metaphors (like this one). In the censorship game the only artistic aesthetic allowed is that which is respectful of increasingly long lists of sensibilities and oversensitive social groups. The aesthetic autonomy of the artist and of the artwork is increasingly restricted. Therefore, what is left to be hanged is the silence of the artist. In this contemporary art arena of fake pre-marketed ‘scandalous artworks,’ after years of patient engagements, I had enough of it and decided to say what I have been self-censoring for quite a long time, without formalistic and formal restrictions. I even decided to write in the first person abandoning the issue of supporting and justifying with a quantitative and qualitative analysis what I am writing in order to fit the requirements of an ever more mediated, pseudo-scientific and sociological approach to art. I decided to just write about the immeasurable quantity that is fine art and its trajectory of disappearance. This is if we are to believe to Theodor Adorno’s statement that “art’s double character as both autonomous and fait social is incessantly reproduced on the level of its autonomy.” 1Theodor W. Adorno, Aesthetic Theory, ed. Gretel Adorno and Rolf Tiedemann, trans. Robert Hullot-Kentor (London: The Athlone Press, 1999), 5. There is an imperceptible artistic knowledge 2"The element of knowledge in art is this moment of profound recognition, in which we do not see again the familiar, but rather grasp fully and completely what we already know, yet only roughly or in outline. Put another way, in the work of art the feeling or spirit of something lived through or encountered is concentrated and expressed." Ian Heywood, Social Theories of Art: A Critique (New York: New York University Press, 1997), 160. based on a gut feeling that is both impossible to be scientifically proven as well as undeniably true in its prescient knowledge of an absolute truth. Pier Paolo Pasolini comes to mind with his strong affirmation and justification of the existence of knowledge without proof, when he wrote “I know. I know… I know…” in an article in the Italian newspaper Corriere della Sera, 14 November 1974, titled Cos’è questo golpe? Io so (What is this golpe? I know). Io so. Ma non ho le prove. Non ho nemmeno indizi. 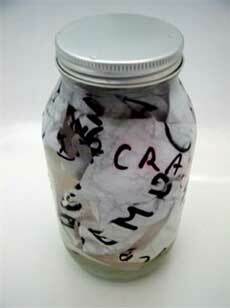 Io so perché sono un intellettuale, uno scrittore, che cerca di seguire tutto ciò che succede, di conoscere tutto ciò che se ne scrive, di immaginare tutto ciò che non si sa o che si tace; che coordina fatti anche lontani, che mette insieme i pezzi disorganizzati e frammentari di un intero coerente quadro politico, che ristabilisce la logica là dove sembrano regnare l’arbitrarietà, la follia e il mistero. I know. But I have no proof. I don’t even have a shred of evidence. I know because I am an intellectual, a writer, someone that attempts to understand all of which happens within society, to know all which is written about it, to imagine all which is not known or it is silenced; someone that co-ordinates facts even if distant, that puts together the disorganized and fragmented pieces of an entire coherent political framework, someone that re-establishes logic where arbitrariness, folly and mystery appear to reign. And this is the point of the whole exhibition non-event, I Am Sorry the Exhibition Has Been Censored by the Artist, taking place over a year of analyses and reflections on elements that are not linked or even joined together, but presented as dispersed activities or fantasies of lunatics and crazed people. Bordering between the folly and the social representation of a disintegrated society, beyond what Michel Foucault defined as the madness of civilization, the interventions through art and aesthetic in a political representation can only be reduced to a spoof art event. The madness is not that of oneself believing to be God, 3Michel Foucault, Madness and Civilization: A History of insanity in the Age of Reason, trans. Richard Howard (London: Routledge, 2001), 264. but that of oneself believing to be free. Therefore the artwork that does not exist is the only possible reality of a madness disguised as unrealized digital alternatives to reality itself. The thinking that cannot be freely discussed can barely be expressed by the artist through a joke or sarcasm with the hope that not too many people will note or comment on it; and if they will it will be within the context of a forgivable madness. This approach of inadmissible evidences, bordering on the visions of the mad, is the possible way to gain an instinctual and truthful knowledge. By joining together distant events, farcical corruptions and by reversing the media spin, the lucid analyses and grotesque illegalities hidden under the veil of the aesthetic joke, the madness and irony of art reveal the contemporary realities of failing democracies. 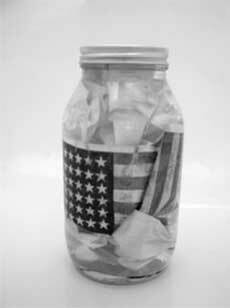 Everything, even the apparent suicide of Mark Lombardi, who linked and evidenced in his artworks prior to 9/11 the connections between global finance and international terrorism, so much so that the FBI impounded his artworks, contribute to the unspoken fear of deranged governments and the reality of censored aesthetics. These forms of aesthetic unproved revelations and unfathomable truths are part of the basic construction of a series of artworks that, existent or non-existent, focus on the impossibility of discussing the social and political beyond boundaries of spoof aesthetic representations. When Peter Lunenfeld writes about the impossibility to rally around irony in a work of art for more than ten minutes, 4Peter Lunenfeld, Snap to Grid: A User's Guide to Digital Arts, Media, and Cultures (Cambridge, MA: The MIT Press, 2000), 2. he wrongly closes the doors to the revelatory role that ironic socio-political artworks absolve. He also forgets how strongly irony is actually punished in dictatorial regimes for its enlightening, undermining and revelatory role. The Joke by Milan Kundera is a literary example where the protagonist is condemned to a prison camp for a joke written on a card. The story unfolds from a joke into the horrors and fears of historical events and Kafkian literary memories. These are some of the layers that constitute my one year long artwork, which beyond the forms of representations and transmediation, existed and will exist in the realms of spoof art until the 1st of April 2008 at Tate Modern in London. 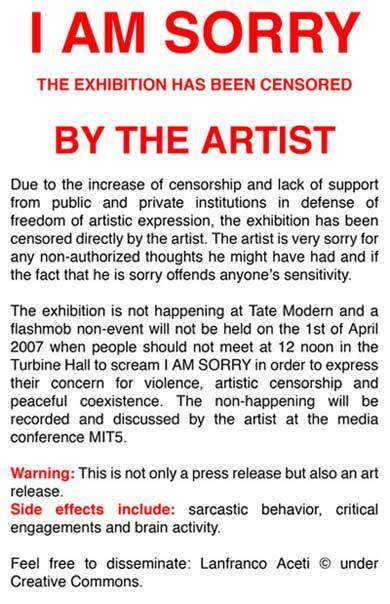 Since its conception and its first manifestation with a scream on the 1st of April 2007 in the Turbine Hall at Tate Modern, I Am Sorry the Exhibition Has Been Censored by the Artist was nothing other than a series of contradictory feelings. Democracy at its peak is nothing else but the sensation of being free. Unfortunately the sensation of being free has disappeared in the contemporary society of democratic surveillance, of cowardly defense of the capital instead of the principle of art. The censorship of John Latham’s artwork God Is Great (#2) by Tate Britain with the justification of ‘security issues’ defines the end of Western democracies and their ethical values, if they ever were alive. The death of democratic values is the death of a liberal arts student, Captain America, who embodied for half a century to the world the ideal and ethical values of America’s democracy. And in appearance, art and its manifestations, although restricted, have the opportunity to exist in the framework of a joke, where devoid of any serious content, the artwork is nothing else than a superficial engagement that questions everything, included its own existence and that of the artist. Figure 1 The Art Release, Lanfranco Aceti, 2007, digital print from Networked Event at Tate Modern (30 cm x 50 cm). Entering in the Turbine Hall at Tate Modern to scream “I Am Sorry” on the issue of contemporary artistic censorship, on the ever-increasing lack of freedom of expression, is possible only under the disguise of irony. This is the reason why the screams are officially possible in the Tate only on the 1st of April 2008, although people can still voice their discontent and record their screams and forward them to www.myspace.com/lanfrancoaceti where the rules of engagement for this one-year long project are explained. Democracy in itself, in this project, becomes an irony, something that can only possibly exist as a joke and that is disappearing or being marginalized from daily life. As in the Saturnalia of the ancient Roman Empire, it becomes possible to express freedom and tomfoolery for one single day, in this case the 1st of April, when the normal technological dictatorial conditions of our existence can be reversed and the reality revealed under the disguise of madness and joke. But all of this is without transgression. The revolutionary application of freedom is instead exercised within the boundaries of a strict and encoded protocol of behaviors. It is a revolution approved by the authority, a transgression authorized, a fake event to stage the pretense of freedom validating its very absence. And unfortunately, even the digital, in its struggle between democratic tool and surveillance fascist construction, contributes to increase the levels of control and protocols of behaviors. I Am Sorry the Exhibition Has Been Censored by the Artist questions its own existence and its own function, revealing the dichotomy between the necessity to exercise freedom in order to witness the reality of democracy and the illusion of a democracy of non-exercised freedoms, of a democracy not exercised for fear of retaliation, for fear of punishment. The so-called revolutionary element of art is necessarily pre-approved, evaluated and authorized in order to exist. The only other possibility left is that of a self-censorship, which played on the level of reality and unreality, leaves the viewer to question the reality and unreality of democracy and contemporary social structures. Spoof art is the product of a spoof democracy. In this context democracy becomes something that can be only discussed under the veil of a joke, having becoming a joke in itself through its daily manifestations and empty forms of representation. Irony, therefore, is the only functional structure allowing an engagement, that of presenting a joke and revealing the reality of existence under the shield of irony. Art in all of this absolves a revelatory function. And it is through irony that art allows the conscious understanding of the marketed representations of democracy, the mediatic spinning of its failures and the ‘razzle-dazzle’ shined to hide the reality of a contemporary post-industrial de-humanized condition in the western world which is subservient to an illiberal post-capitalist and globalized society. But how much of this is helpful in the debate to understand the golpe that is hijacking contemporary democracy, stifling forms of participation and freedom of expression under the control extended from the social to the cultural forms of visual representation? Jean Baudrillard, in speaking of the conspiracy of art, identified the production of aesthetic and cultural values as a dominion of the establishment and within preauthorized and homogenized structures. 5Jean Baudrillard, Paroxysm: Interviews with Philippe Petit, trans. Chris Turner (London: Verso, 1998), 102. The problem is that the restriction of art to a ‘homogenized feed,’ a pre-digested and neutralized experience of chewed up aesthetic values is fundamentally structured within the contemporary frameworks of homogenized and pre-authorized behaviors. A chewed up and spat out democracy, a chewed up and spat out American Constitution (in representation of ideals and hope of democracy that the American and the Europeans never achieved and the remaining vast majority of the world’s states never had), a chewed up and spat out American Flag, these could be the contemporary artworks if John Latham hadn’t already chewed up, spat out and then distilled the pages of Clement Greenberg’s standard work of art criticism, putting the resulting alcohol in a glass phial. The artwork, Still and Chew/Art and Culture, is dated from 1966-1967 and is in the MOMA collection. 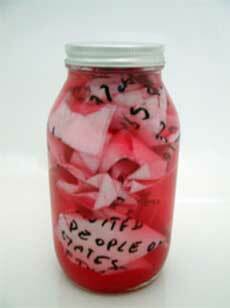 Figure 2 The Remnants of Democracy, Lanfranco Aceti, 2007, mixed and digital media spoof art. Figure 3 An Ideal Rant, Lanfranco Aceti, 2007, mixed and digital media spoof art. Figure 4 Put to Rest, Lanfranco Aceti, 2007, mixed and digital media spoof art. This is a refuge that imposes on the artist and the artwork itself the risk of not being taken seriously. The artist becomes insane, as Michel Foucault writes, and is regarded as a child who needs to be given punishments and rewards. 7Michel Foucault, Madness and Civilization: A History of insanity in the Age of Reason, trans. Richard Howard (London: Routledge, 2001), 252. But this refuge dilutes the artwork and its context to the limit of nothingness, reducing it to silence. In this particular framework democracy disappears and becomes the ghost of a joke, the argument that can be discussed only in ironic terms, as a failed artistic representation of itself. But also art that engages with the political, with the loss of meaning, with the ironic, with the void of contemporary social engagements, necessarily falls in the trap of censorship. The aesthetic visual and conceptual referentials for a meaningful interaction disappear in the attempt of the artist and the artwork to exist beyond the conflicting relationship between freedom and censorship. In order to exist, to be art, to be conceptual art, social art, political art, the artwork is reduced to exist in illegality or is reduced to laughter. All the remaining artworks are engaging with the void by being void or as Jean Baudrillard wrote they exist in the “genial sharing of nullity.” 8Jean Baudrillard, The Conspiracy of Art, ed. Sylvère Lotringer, trans. Ames Hodges (New York: Semiotext(e), 2005), 28. Through being visual homologated and homologating productions, repetitions and repetitive void conceptual structures, represented and remediated, these artworks exist in a constant attempt to generate an originality that is structurally limited to the media’s technological innovative framework. In other words, the medium is the message, but the message of the medium is a censored void. Figure 5 Empty Stand, Lanfranco Aceti, 2007, mixed media and spoof art, digital print from still of performance at Tate Modern (17cm x 13cm), duration: ten minutes. Because of this struggle between imposed censorship and servitude of the content to the technological, the obliged refuge is the ironic as the only possible territory for artistic engagement. The artist has been left with only one possibility: self-censorship. This was the reason for I Am Sorry the Exhibition Has Been Censored by the Artist that will last from the 1st of April 2007 to the 1st of April 2008. To demonstrate the impossibility of any art form challenging preconceived systems, challenging the cowardice of the establishment as well as that of curators who, under the mantle of ‘public order,’ refuse to prioritize art over the violent threat of censorship from both governments and fanatical groups in a dangerous alliance threatening both art and democracy. The artist stands, on an empty wall, under the irony of its silence, while the reality of existence has to wait to be expressed on the next April Fools Day, when the foolishness of democracy and its values will be ironically displayed rallying people, as Peter Lunenfeld would say, for just ten minutes. I’d say, better ten minutes than nothing at all. This research was made possible through the support of the Slade School of Fine Art. Special thanks go to Prof. John Aiken, Slade Director and John J. Francescutti, curator for digital arts. Dr. Lanfranco Aceti is an artist and academic. His interdisciplinary research focuses on the intersection between film, visual arts and new media technology. Dr. Aceti’s research has been funded by the AHRC and The Leverhulme Trust. He has lectured and exhibited internationally. Previously an Honorary Research Fellow at the Slade School of Fine Art and a Leverhulme Artist in Residence at the Department of Computer Science, University College London, he is now an AHRC Postdoctoral Research Fellow at Birkbeck College, University of London, School of History of Art, Film & Visual Media and a Visiting Research Fellow at the Victoria and Albert Museum. His theoretical and philosophical interests explore the issues of globalization, secularism, religious censorship and multiculturalism in relation to contemporary media and technological applications.